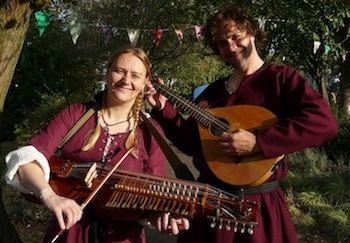 Vicki & Jonny are able to offer period work in the medieval style. Using authentic instruments and costume. Medieval banquets, park openings, weddings... contact us to discuss your requirements. Vicki & Jonny are also proud to be part of the Blast from the Past team of muscians. The earliest statue of a nyckelharpas date from 1326 and the earliest instrument in existence is dated 1526. The Cowhorn was used by the Vikings for communication. The earliest surviving instrument dates from around 850. Meet the kohorn. 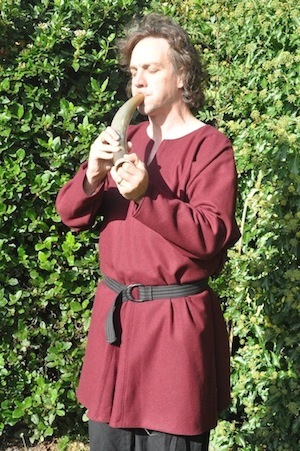 Bagpipes have been found all over Europe during medieval times and were mentioned in the Cantebury Tales (dated 1380). The Willow flute was an old shepherds instrument made in the spring that only lasted a few weeks whilst the sap was rising in the willow tree. ... and of course songs.